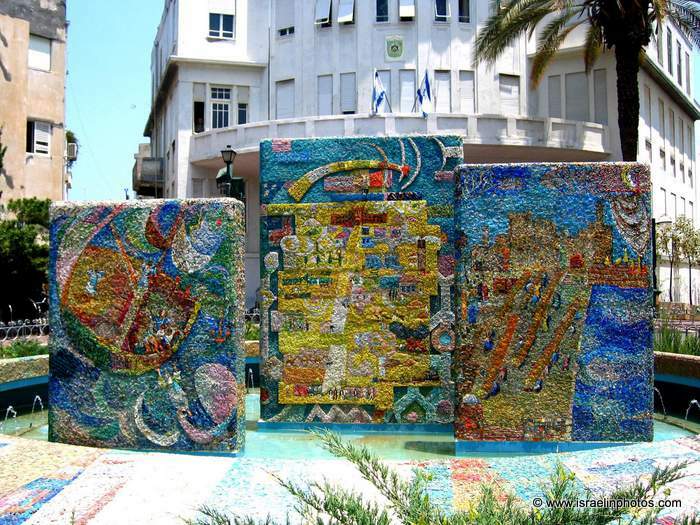 The Twelve Mosaics are situated around the fountain in front of the Old City Hall, Bialik Street 27. 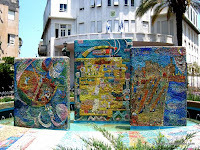 The mosaics tell us the history of Tel Aviv-Jaffa throughout the ages. 2. 1482 BC. 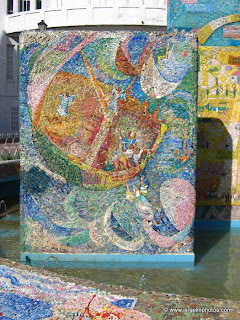 - Tsahouti, the commander of the army sent by Thutmose III, succeeds to take Jaffa by ruse. 3. 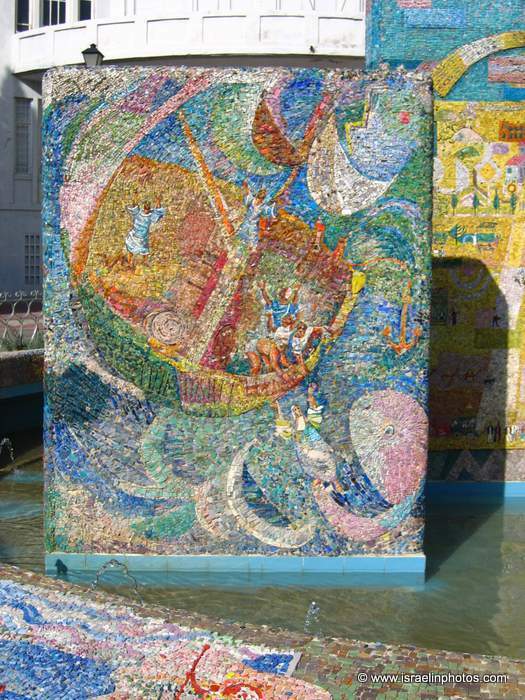 Tel Qasile (near the Yarkon River) on the mosaic we see the fortress, the port and a long caravan from the era of the Judea Kings. 4. The battle between Richard the Lion heart and Saladin (1191-1192) (Notice the almost abstract style in this section). 5. 1799 - Napoleon Bonaparte who conquered Jaffa, visiting his sick soldiers in the Armenian Monastery, despite the dangers of the raging plague. 6. The title of this section is "Shabbat in the Jewish yard". 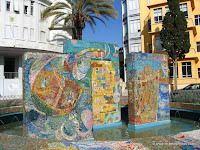 I the beginning of the 19th century starts a revival of the Jewish community by immigration from North Africa. Heshiahu Agiman from Istanbul acquires a group of houses and a synagogue around a large courtyard. In the center of the yard- Rabbi Yehuda Margoza, the Rabbi of Jaffa, The Aharon Chlouche and the sons of the Matalon and Moyal families. 7. Montefiore's Orange grove (1855). Sir and Mrs. Judith (1784-1862) Montefiore visiting the orange grove and orchards he bought. 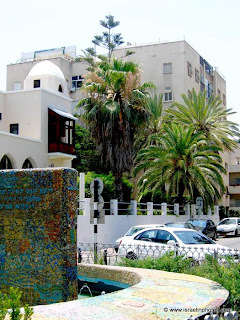 This was the first agricultural estate in Israel. Haim Amazleg, the British Consul General in Jaffa, accompanies them. Montefiore, Sir Moses M. (1784-1885) was born in Livorno but lived in England most of his life. English Philanthropist. He amassed a comfortable fortune, largely through close collaboration with N.M.Rothschild, and was able to retire from business at the age of forty. In 1837 Montefiore was sheriff of the city of London and the first English Jew in modern times to be knighted. He was profoundly pious and became famous throughout the Jewish world by his mission to the Levant at the time of the Damascus Affair in 1840. He interceded personally on behalf of the Jews of Russia (1846, 1872), of Maroccco (1863), of Romania (1858), and more. He visited Palestine on 7 occasions, the last time at the age of 90. In Palestine, a.o. 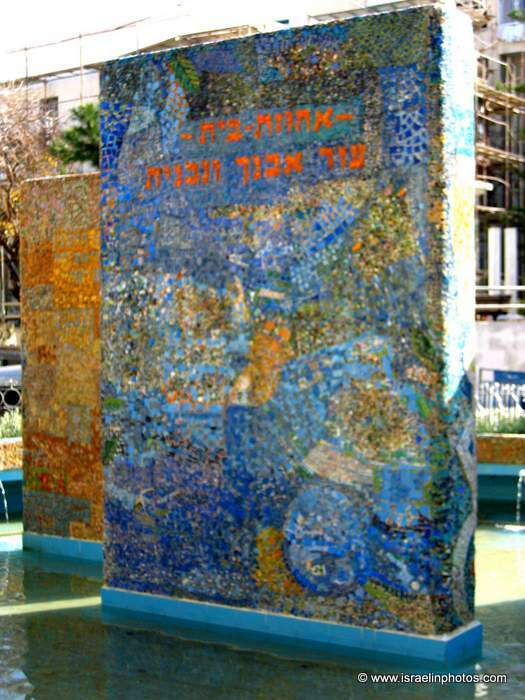 he worked to improve the status of the Jews by creating employment through industry and agricultural settlements. Montefiore was President of the Board of Deputies of British Jews (1838-1874), in which capacity he strenuously opposed religious reform tendencies. 8. Herzl in Jaffa (1898). Herzl's reason was to meet Kaiser Wilhelm II. He stayed at the Kaminitz Hotel. 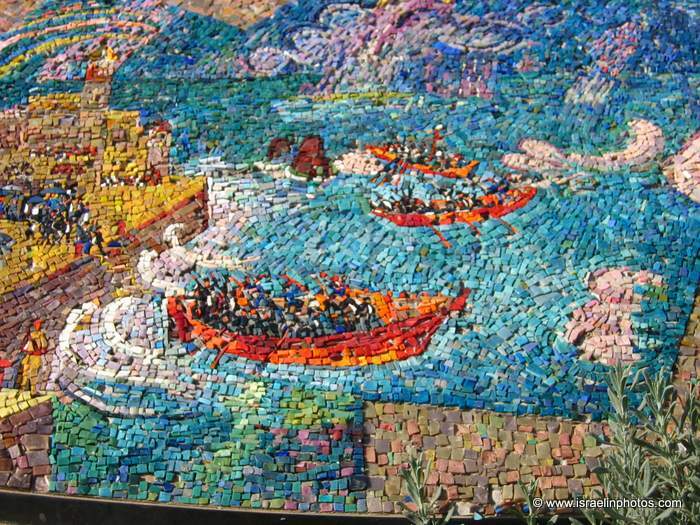 In the mosaic we see Herzl and his entourage. Brenner, Joseph Haim (1881-1921), born in the Ukraine. He began to edit the Bund newspaper in Homel in 1898. In 1900 his first sketches describing Jewish poverty in Russia appeared. Shortly after that, he started to make a name as a novelist. In 1903-1907 he lived in London where a.o. he published the monthly Hebrew journal called HaMe'orer. In 1909 he settled permanently in Palestine where besides his writing he became a leader of the workers movement. 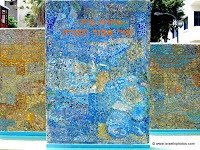 He also taught at the Herzlya Secondary School, published critical essays, and translated world classics into Hebrew. In 1919 Brenner began to edit Ha'Adama, the journal of Ahdut Ha'Avoda. In 1921 Arabs in Jaffa murdered him. Chatting with Brenner are Joseph Aharonovitz and Deborah Baron. Baron, Deborah (1887- 1956) was born in White Russia. She was a Hebrew novelist who settled in Palestine in 1911. Her stories deal mostly with life small Jewish communities of White Russia and are mainly for children. Apparently she was one of the first "women's libbers" as she preferred to keep her own last name. 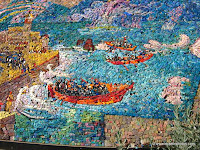 Further seen in the Mosaic are the Rabbis Kook and Uziel. Kook, Avraham Yitzchak (1865-1935).He was the Rabbi of Lithuania, 1889-1895; Latvia, 1895-1904 and in Jaffa from 1904. He began his literary career at the age of 23 (1888) by editing and publishing a rabbinical journal. One of his articles "Te'udat Yisrael u-Leumiyuto" became the ideological basis of the Mizrachi movement with which he was closely associated. In 1909, he permitted certain agricultural work to be done during the Sabbatical year. He left for Europe in 1914 and because of the outbreak of World War I, returned only in 1919. During this period, he officiated in Switzerland (1914-1916) and London (1916-1919). 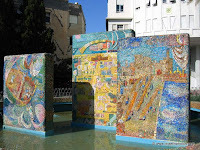 In 1921 he became Chief Rabbi of the Ashkenazi Community in Palestine. At that time he established a yeshiva called Merkaz HaRav. 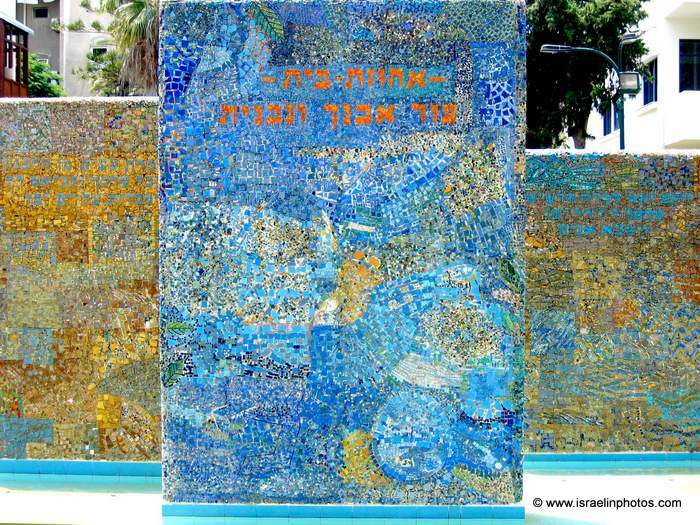 Uziel, Ben Zion Meir Hai (1880-1954), was born and educated in Jerusalem. 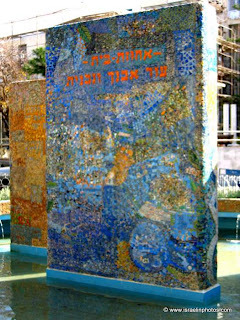 In 1939 became Rishon LeZion (Sephardi Chief Rabbi of Palestine later of Israel). He was a prolific writer on halachic and other topics. Other known people from these days walk in the alleys while workers, artisans work in their shops, and a woman draws water from the well. 10. The Jaffa Port where new immigrants arrived. 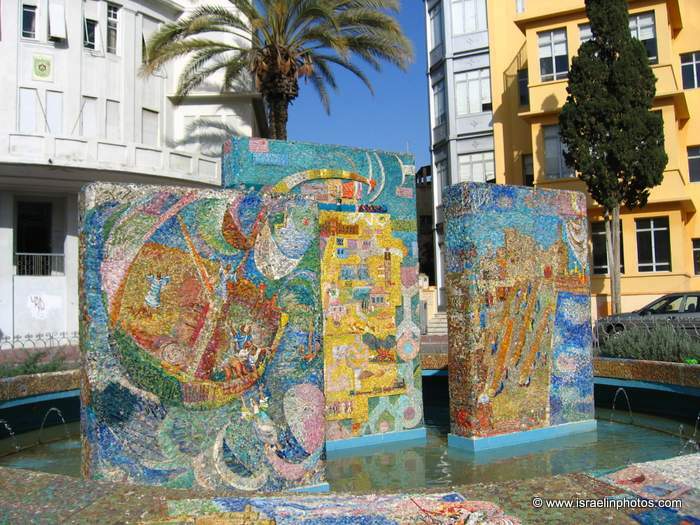 They spent their first few days in Jaffa and from there find their ways to different places throughout Palestine. 11. Tel Aviv at the beginning of the 1930's. 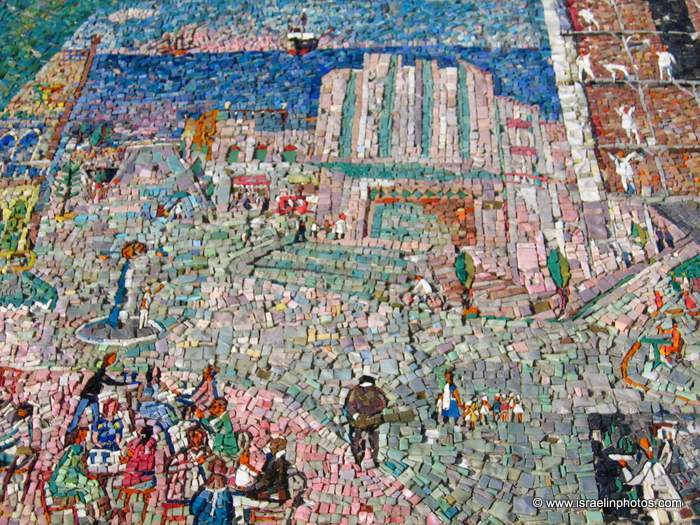 The famous poet Nachman Bialik takes a stroll through the building sites of the city. 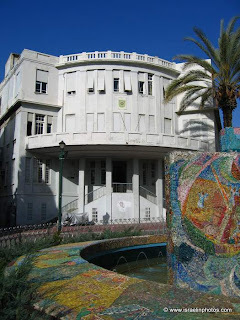 On the right site is Mugrabi's Circle with its famous cinema. 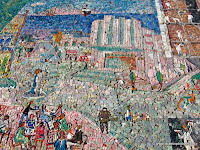 On the left site of the mosaic is an artists' café, a table with literary rebels sitting together (Alterman, Shlonsky, and Eliezer Steinman). At another table the old brigade- Fishman, Burla, and Borash. 12. 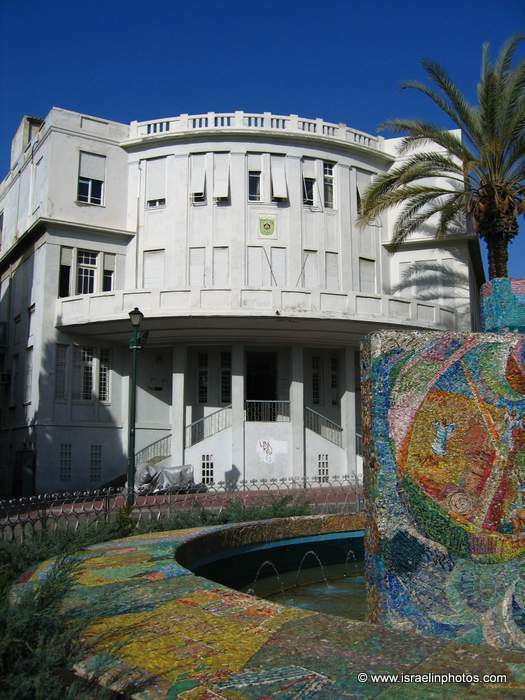 May 14, 1948: Israel's Declaration of Independence by Ben Gurion took place at the Museum on Rothschild Blvd., the house of Mayor Meir.